Alessia Cosmo silhouetted by the setting sun. ITALY - From today there will be a big gap in both Italian and international tournaments. Our piccola grande Alessia left us too soon, and we can only shed a tear and remember the many beautiful moments that passed between us all together. Tina Christensen (center) in the OEMC 2011 in Italy. Tina Christensen has decided to resign as president of the European Mahjong Association because of her duties as a scientific advisor at the Danish Meteorological Institute. Mahjong News reflects upon the ‘Mahjong Lady’. Nicole contemplating her next move. UTRECHT, the Netherlands - Mahjong News is pleased to announce the addition to its stellar line-up of hard working journalists it's newest reporter, Ms. Nicole Haasbroek from the Netherlands. She will be augmenting an already well-rounded workforce to help bring the news on mahjong to world. PÓVOA DE VARZIM, Portugal - President of the Association Suisse de mahjong, Presidium member of the European Mahjong Association, and board member of the Mahjong International League, Luc Humbert, has been elected President of the EMA. Tina Christensen from Denmark, who had been president since 2011, had to lay down her function since she could not combine it any longer with her job duties. 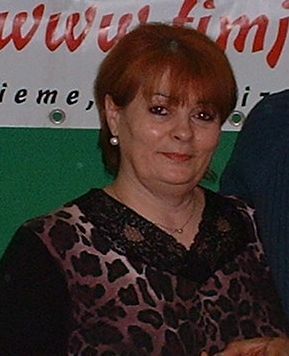 ROME, Italy - With great regret we inform you that Rosanna Camerani, historical member of the Club Drago Verde di Cervia, has suddenly left us. We remember her as a warm person, always willing to play, by any method, as soon as there was an opportunity.